The bus we had taken from the junction coming from the Kinabatangan dropped us off right in front of the entrance to Kinabalu National Park. It was a three hour trip that took us along winding roads. There was a brief stop for lunch where Dan and I bought some pineapples cut into squares and a fruit that looked and tasted like macopa. As we stepped off the bus on the curb of the large parking lot and eatery across the road to the park headquarters, the cool air greeted us. 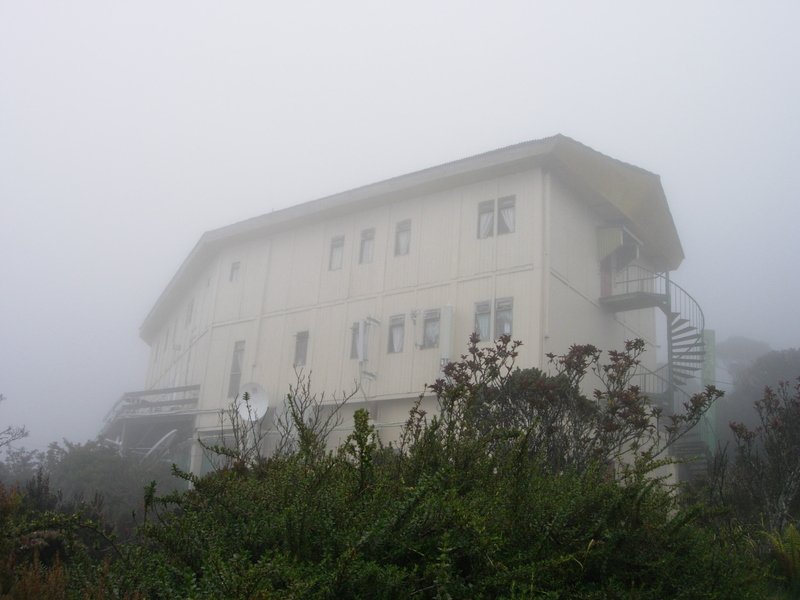 The friendly staff pointed us to the Mountain Resthouse about a hundred meters away. If it was any indication of what we would do the next day, the resthouse was on top of a low hill with a few staircases to get to the reception area. The middle-aged woman who I shall refer to as “manang” brought us to the second deck where I was made to choose between a room with a double bed and a single bed or a room with just a big double bed. Both had ensuite bathrooms but not hot water. I chose the latter because it had a balcony which would come in handy if we wanted to dry our stuff. The resthouse was very basic but clean. It was only RM30 per night so we couldn’t really ask for more. We just dropped our stuff then headed to the park to register for the climb. It was about 2 pm so there were hardly any people around as most are presumably on the way up or down. First stop was at the Mountain Torq office to register. We had already reserved and paid our slots at Whoa Adventures previously. As I filled-up the form, t he girl said to hope for good weather as strong rain would mean that park rangers cancel the summit climb and the Via Ferrata. Apparently, the previous week had had all-day rains and it was only in the recent days that the weather had been merciful. Saying goodbye to the summit AND to the Via Ferrata would have been a real bummer and waste of a lot of money. No refunds. But we were optimistic. After all, the gods had been blessing us since the trip began. The weather had been generally cooperative with just brief showers that stop in time for any activity to begin. We bought some badges for RM12 then went to the headquarters of Sabah Parks to pay the park fees and the guide. We were told to go back the next morning when the office opens at 7 so we can get our guide. At the transport office, we paid for our return park headquarters-Timpohon gate shuttle. The entire registration process was smooth and easy. The fees were a little hefty though. RM 107 each for the climbing permit and insurance and RM 85 for the guide for both of us. The return shuttle was at RM 16. Since it had began showering, we decided to just head to Balsam for some lunch. Or maybe because I saw the word “buffet lunch” so I just used the showers as an excuse. Hehehehe. It was almost 2pm and there were quite a number of people who had come down from the mountain already. A group of school-age girls from the UK occupied a table and every time someone arrived, they would clap. At another table sat a young Japanese couple who looked utterly exhausted. Perhaps they had just made it down. The UK girls all seemed cheerful and happy. Even Kelly, the recently-arrived girl didn’t look too exhausted. 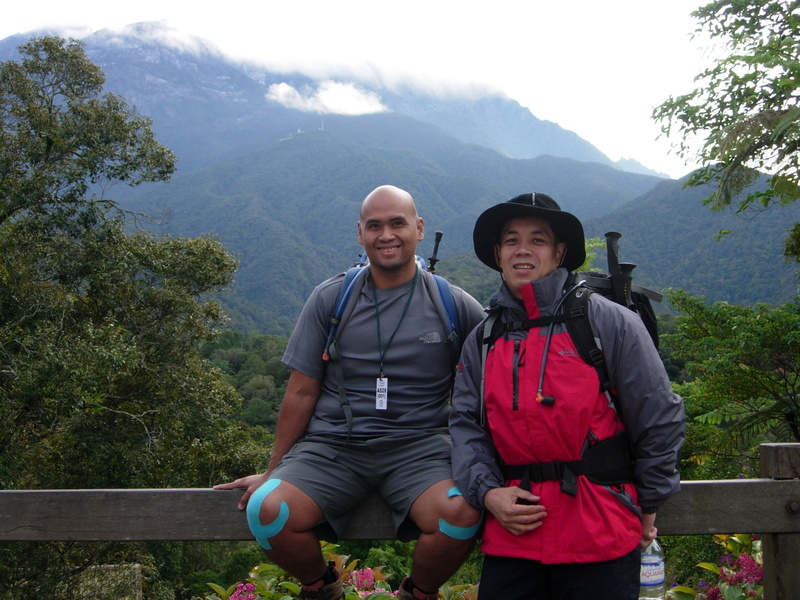 We felt like gluttons eating all that food surrounded by people who just summitted and gone down Kinabalu while all we have ever done yet was to register. The food wasn’t particularly good but it was enough to satisfy. I had my fill of fried noodles, chicken in sweet chili sauce, sausages, fish fillet, and banana and taro fritters. The shower had ended by the time we finished lunch so we decided to just walk around the park. We came upon the entrance of the Pandanus Trail but decided against taking it as I was in sandals and didn’t want to risk slipping. We followed a sign that pointed to the Botanical Gardens instead. Walking along the road, we passed by a young white boy who suddenly exclaimed, “Watch out!” We stopped on our tracks and on Dan’s feet lay a squashed centipede. “Aaawww. I was going to use this (shaking a leaf) so I could bring it to the side of the road, ” his mom tragically said. “Sorry I didn’t see it,” said Dan and we went on our way while the kid and his mom probably said their eulogies over the dead centipede. The botanical garden was closed so we instead followed a little overgrown path that led to a mossy bridge and a small stream. We decided to head back to our lodging to fix our stuff for the climb and rest. 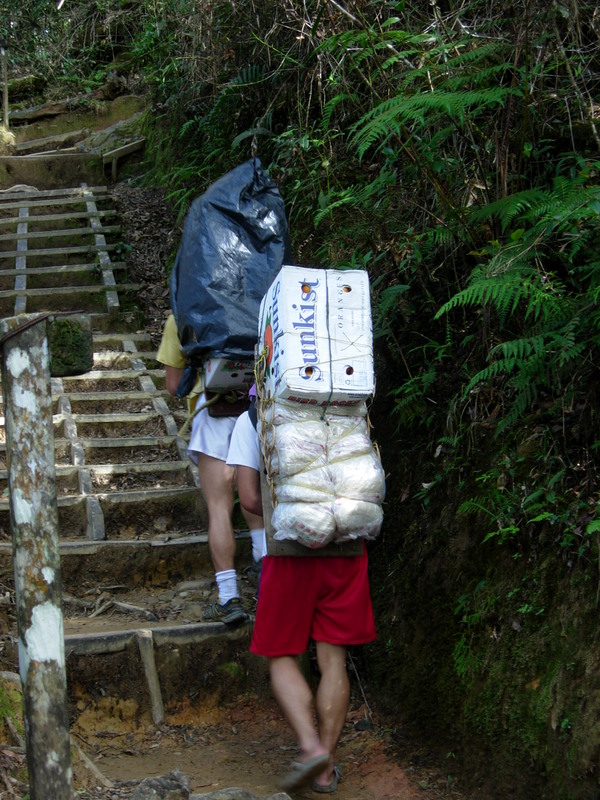 We were to leave our main packs at the rest house then check-in again on the 29th when we got down from the mountain. I had already figured out that doing the Via Ferrata after the summit climb then going down the mountain would have us arriving at park headquarters around 6pm in not very ideal situations for a bus ride to Kota Kinabalu. Better to stay another night at the rest house to recuperate. The Climb Up. We were at park headquarters by 7 am to get our guide. We were assigned Maik (short for Maikin), a young Dusun who apologized that he didn’t speak English very well. I told him I spoke some Bahasa-Melayu so we would do just fine. The sky was clear and the weather seemed perfect for climbing. People were starting to amass at park headquarters and there was a palpable air of excitement. The shuttle arrived at 7:30 and we were whisked off to the Timpohon Gate. Wanting to avoid the crowd, we immediately started out. The trail deceptively led downhill to Carson’s Falls then along flat wooded pathways. A few meters later, everything started climbing and climbing and climbing. 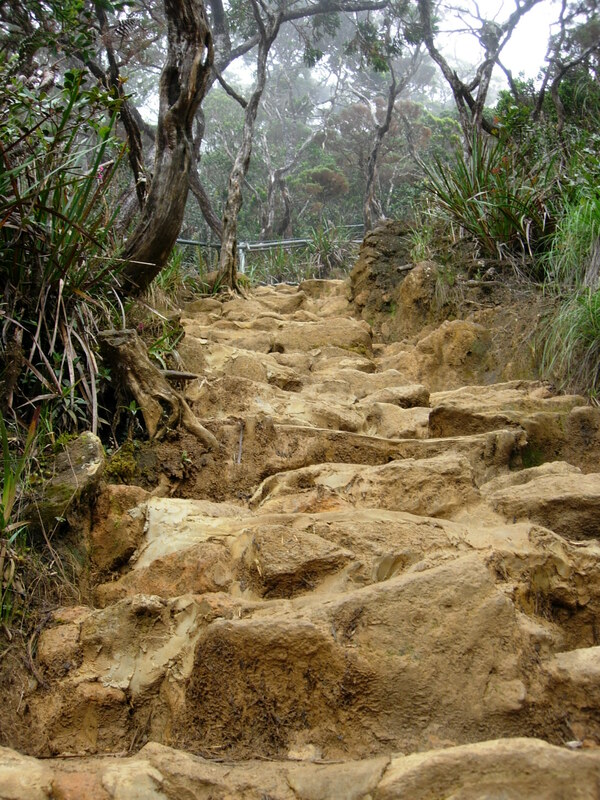 It was just steps steps steps—steps carved out of the mountain, wooden steps placed over steep surfaces, natural stone steps, steps from the trees of roots— it was like going up and up and up on a broken escalator. Huts or pondok were laid out every 400 meters where one could rest, go to the toilet, and fill-up on water. We caught up with a small group of middle-aged Malaysian and Singaporean climbers (4 women and a man) who were resting in one of the pondok. They were all very friendly. We set out together but soon overtook them. I was actually climbing quite leisurely as I knew it was going to be a long long hike and I was conscious of the thinning air. 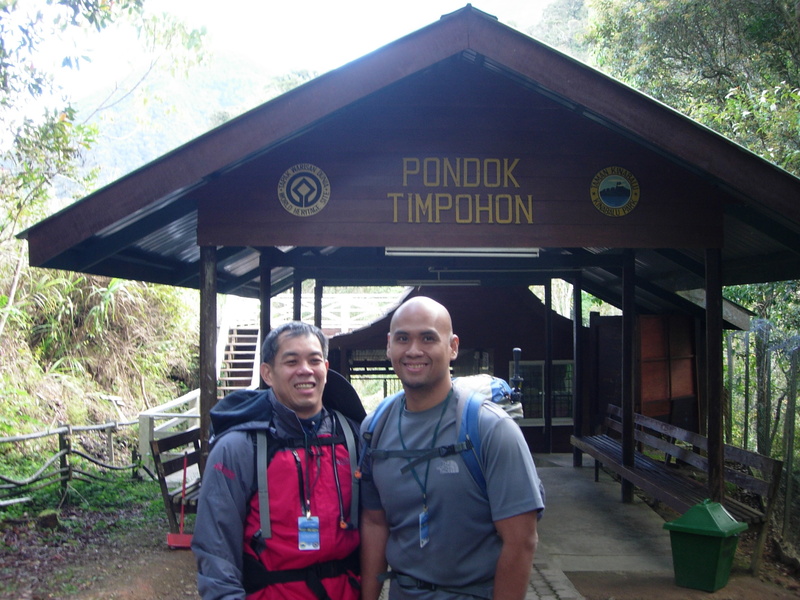 Past the 2.0 kilometer mark, I started leaving Dan behind with the guide and would instead wait for him at the pondok. Sometimes, there would be a little traffic jam as groups of climbers going down would meet those going up. As you can see from the picture below, on reaching the 3.5k mark, I felt accomplished. After all, that meant I was done with a little more than half the distance. The Torture Begins. Reaching Pondok Layang-Layang where the Mesilau Trail met up with the Summit Trail, I waited for Dan about 10 minutes, the usual time difference between us. There was a big group of whites there which included a 70-year old lady! It had began to get cold and I put on my jacket as I was only in shorts and shirt. Wanting to move on, I decided to just continue all the way to the top without waiting for Dan. At least he had the guide with him. I was climbing alone most of the time. The trail had become really steep by now and there were mostly large stones and rocks and stone surfaces to hike on. I shuddered thinking the difficulty these would pose on the way down especially if it rained. Can you beat these guys running up and down the mountain? 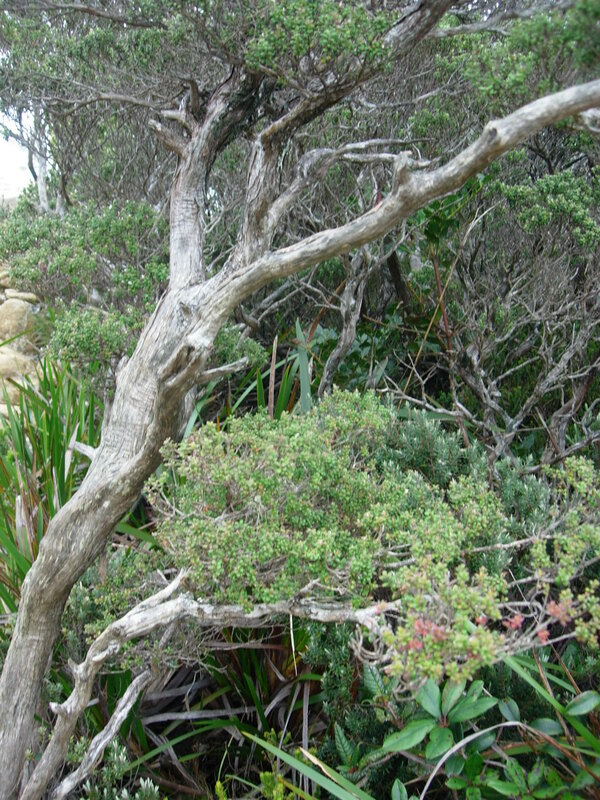 Trees had began to become gnarled and the vegetation stunted, signs that the elevation was very high already. I felt a little claustrophobic inside the forest especially when the mist came in. My goal was to reach Panar Laban, 3,000+ meters on the mountain or 6 kilometers up where the accommodations were, by 12:30 to have my packed lunch at the Pendant Hut where we were to stay. Fatigue had begun to set in and my pace was slowing down. Me and the Squirrels. At the 5.0 kilometer marked, I decided to take a break at Pondok Villosa. I was hungry by this time and was cursing myself for leaving my packed lunch with Dan. Fortunately, I had enough trail food with me and water was no problem. I was alone in the pondok and there was nobody in the trail. I am used to being alone on the trail when climbing but for some strange reason, I felt so lonely at the pondok. With squirrels and a bird watching me, I had my lunch of 2 cereal bars. I had forgotten that my chocolates were in my bag and not at Dan’s. It would have perked me up. I continued my walk and finally reached the 5.5 kilometer mark and the last pondok—- Paka. The Last Push. Reaching Pondok Paka was like reaching the Point of No Return (as if you could simply turn back and return to Timpohon at any time in the earlier part of the climb). 400 meters or so between the pondoks didn’t seem to long. 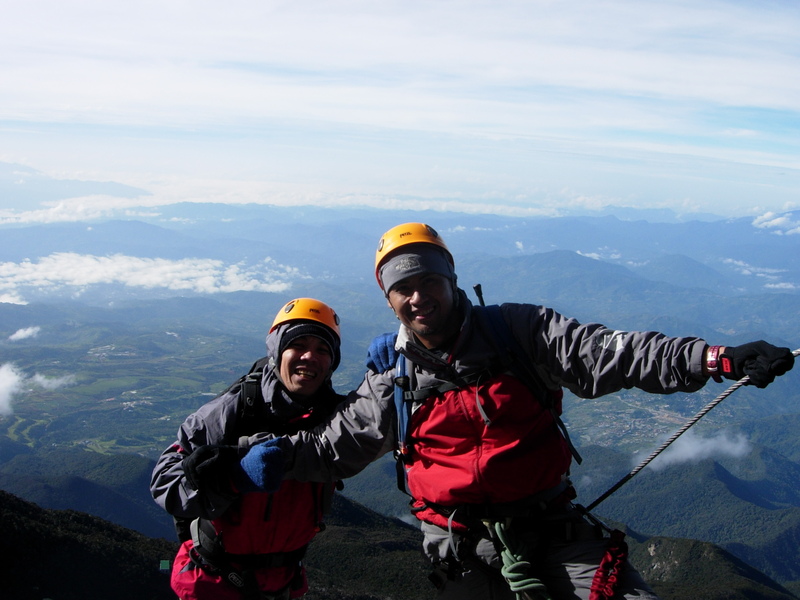 This one was 550+ meters to Laban Rata. My mind and body seemed to have been programmed for 400+ meters. The extra 150+ seemed unacceptable. Normally the final push would be an energy booster—you walk faster and your all buzzed up. I sat and stared at the number. “Stay and rest. Wait for Dan,” my body seemed to be saying. 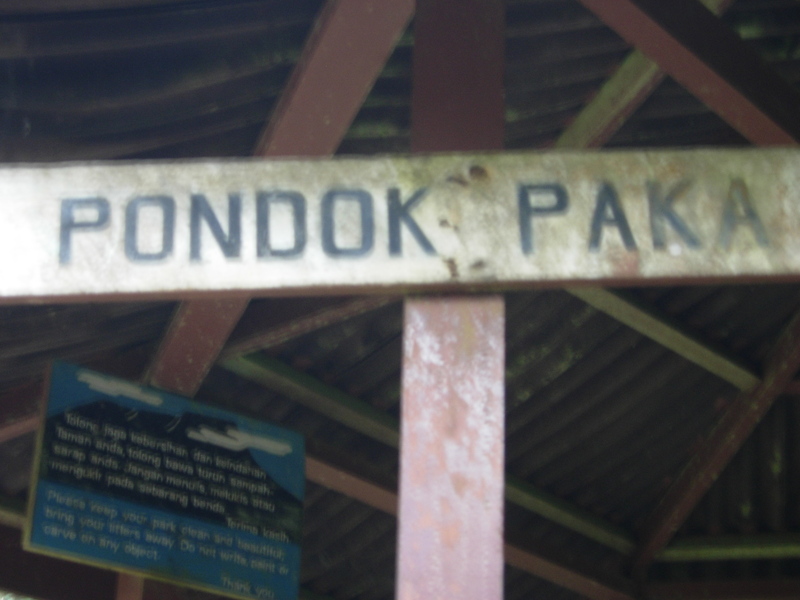 “Beyond this point, there will be no more pondok.” Fatigue and the thin air had probably skewed up my thinking. Sure. there would be no more pondok, but there would be the Pendant Hut where I can check-in, drop my bag, remove my shoes, and lie down on a bed. All that didn’t cross my mind. I simply stared at the sign. I did not want to leave. Weirdly, I felt that this was it. It was the Final Frontier. The Showdown. I think I should have felt that when we began at Timpohon Gate. At least, there’s time to turn back. I snapped out of my thoughts and continued. It was sheer torture by now. I wasn’t walking. I was trudging very very slowly and I could feel the effects of the thin air. I was really glad we did an acetozolamide prophylaxis or I would have been experiencing acute mountain sickness by now. I had to catch my breathe every meter or so. Being alone did not help any. A family of Europeans went past me and I exclaimed, “how far can 500 meters go?” “C’mon. You’re almost there. Keep going, ” encouraged the young man as his parents hiked past me and nodded smilingly. I felt so slow and so weak. Hauling myself up some steep steps, out of the mist, I glimpsed a hut! It was like seeing the pearly gates of heaven. 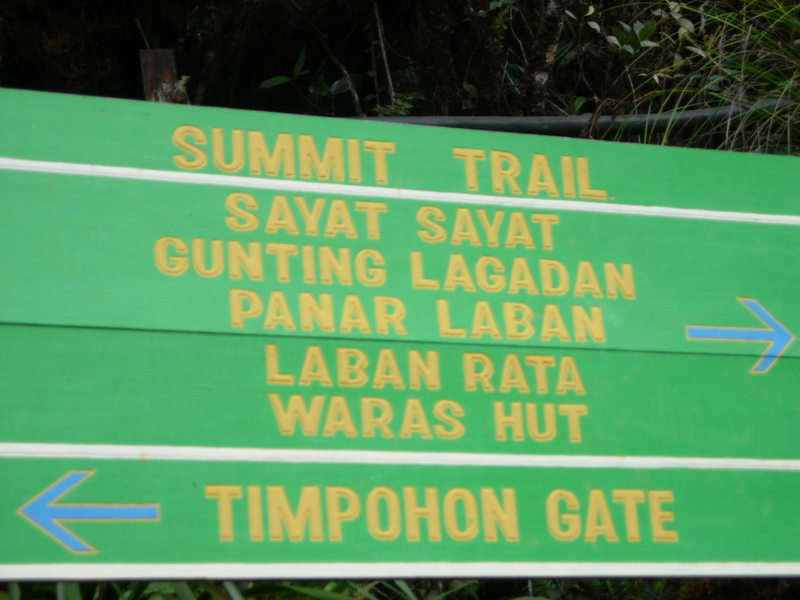 I shook my finger at it and said to myself, “that must be Laban Rata.” It was the Waras Hut. I went past it and a few meters later, I finally saw the iconic Laban Rata. I Made It. “You’re the first one to arrive,” he said. I proudly wrote my name on the register (#1). It was 1 pm and it had taken me 5 hours. The hut was clean and the main room had tables and benches presumably for the morning breakfast. On one side of the wall, a big tarpaulin of the Philippine Everest Team doing the Via Ferrata was displayed. 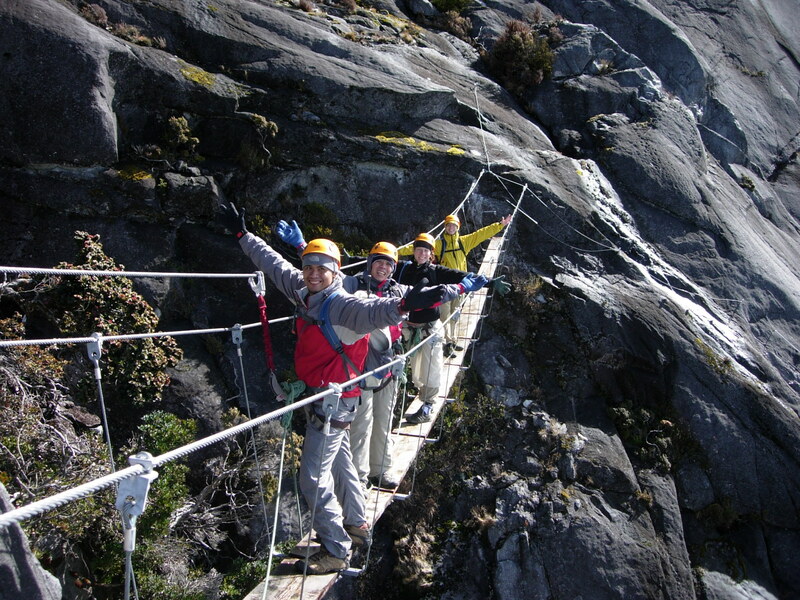 I did remember reading about the Sabah Tourism Office inviting the team to climb Kinabalu via the mesialu Trail and the Via Ferrata. A news clipping was also displayed on the corridor leading to the dorms. He showed me to the dorm beds where I chose the one farthest from the door. A short flight of stairs led to the shower areas. A hot shower and a change of clothes revived me a but and I nuggled in the sleeping bag. I was awakened at a little past 1:30pm by a young German couple who had arrived. I said “hello” to the girl and stood up. Dan hadn’t arrived yet and I was hungry. I was thinking of heading down to Laban Rata for a meal but the sheer cold and fatigue brought me back to my sleeping bag. Besides, we were due for the orientation at 3pm. Finally at about 2pm, I woke-up and saw the familiar face of Maik. I grabbed my packed lunch from Dan and gobbled it up in less then 10 minutes then went back to sleep. A few minutes before 3, I woke-up and went to the main room for the briefing. The German couple had already started theirs and there were three other English-speaking girls (from the UK I think) that had arrived. During the simulation, the Germans both looked and sounded like experienced climbers as they were even discussing their experiences with rope tying and carabiner clamping in Germany. We were intently watching them. Then the staff turned to us and said, “tomorrow you join this team. He (pointing to the guy) will be team leader, she will be #2 and both of you 3 and 4, ok?” We were stunned. The girl looked at us. I suddenly began to feel very nervous. We? Novice Via Ferrata climbers with 2 experience d Germans who looked like they climb up and down mountain cliffs before they head to work? At 3:30, we had our briefing with the 3 other girls who were all doing the Walk the Torque. The briefing was very well done and excited us more. We were shown the route and pictures of some highlights such as the cable bridge and the swinging bridge were shown to us. Then we were taught to put on our harness and practiced setting the rope and carabiners. It all seemed very uncomplicated. More people arrived. I was delighted to see the Malaysians and Singaporean we had encountered on the lower slopes. After the briefing and the simulation, it was dinner time at Laban Rata. On my way out, I asked the guy who briefed the German couple about my concern of not being able to catch up with them as we were novices on the Via Ferrata. I had done some indoor climbing but it wasn’t much. He showed me a list of the other group and said, “I put you with the couple because this other group is going to be very slow.” As he held up the list, I saw the ages of the participants which ranged from 40-52. I understood what he meant. Buffet at 3000masl. Seeing those Kadazan and Dusun guys running up the mountain carrying food supplies and even gas tanks, you just gotta eat and appreciate all that food at the Laban Rata Restaurant. Actually, the thought of the buffet dinner was one of the things that just kept me going. It was 5pm and there was a long line at the buffet table. I had some fried noodles, lamb, fried chicken, and a mini sub. The restaurant, which was thankfully heated, was quite full but the German couple offered the empty space on their table. Contrary to what we had expected, they were very very nice and friendly. When I told our apprehension of slowing them both down at the Via Ferrata, they both laughed. Karin, for that was the girl’s name, said they were both thinking the same thing. In fact, she was wondering why Andy was made team leader and not one of us as we both looked so experienced. They’ve done the Via Ferrata in Germany but it was more of a route laid linking trees together with the elevation no higher than 3 meters. I was so relieved to hear that. They were just as apprehensive as we were. When they both went back to the hut to rest, I ate some more. Dan bought some batteries and a head light at the shop as his wasn’t working. The 2 double AA batteries cost RM50! When we got back at the Pendant Hut, Karin and Andy were already in bed. I took a quick shower and wore my summit clothes already. The constant shuffling about of people kept me awake. I had already taken my medication but still couldn’t completely sleep. It was only when the light was finally turned-off around 10pm did I feel myself drift off to sleep. Walk to the Summit. Dan woke me a few minutes before 2am. Others were already taking their breakfast. I had 3 peanut butter toasts and gulped copious amounts of water. Karin was looking for her guide and couldn’t really remember how he looked like. She showed me a blurred pic on her camera to check if it was the guy sitting on the bench. It wasn’t him. Maik was already there and by 2:30 we were on our way. There was a long long line up the steep wooden steps. After what seemed like a hundred steps, we found ourselves on steep rocks. I remembered what the Mountain Torque staff told us during our briefing. “The Summit Trail is just like the last 500 meters on the way to the hut.” I gotta give it to Maik who paced us very well. While others rushed, he took leisurely steps which ensured that we were at a steady pace. It was freezing cold and the steps just went up and up. Finally, we reached the ledge where we had to cling to a rope as we made our way around the rock face. It wasn’t as steep nor as scary as everyone made it out to be. It was certainly not a vertical fall. The guides were even walking around it. A few hundred meters more of traversing and some scrambling then finally we reached the Sayat-Sayat hut check-point where we had to show our climbing permits. It was also the last stop for a toilet break and to fill up on water. Maik told us to go ahead with instructions to just follow the white rope as he needed to go to the toilet. About 10 minutes up, I suddenly wished I had also taken a toilet break. There is something about seeing a toilet in the mountain that triggers a psychological need to go to the toilet. I almost turned back to to Sayat-Sayat for a toilet break; but the embarrassment of quizzical looks as I make my way down while everyone is making their way up stopped me dead on my tracks. What Am I Doing? There are some moments in some mountains wherein you ask yourself the sanity of what you’re doing. This was one of the moments in one of those mountains. 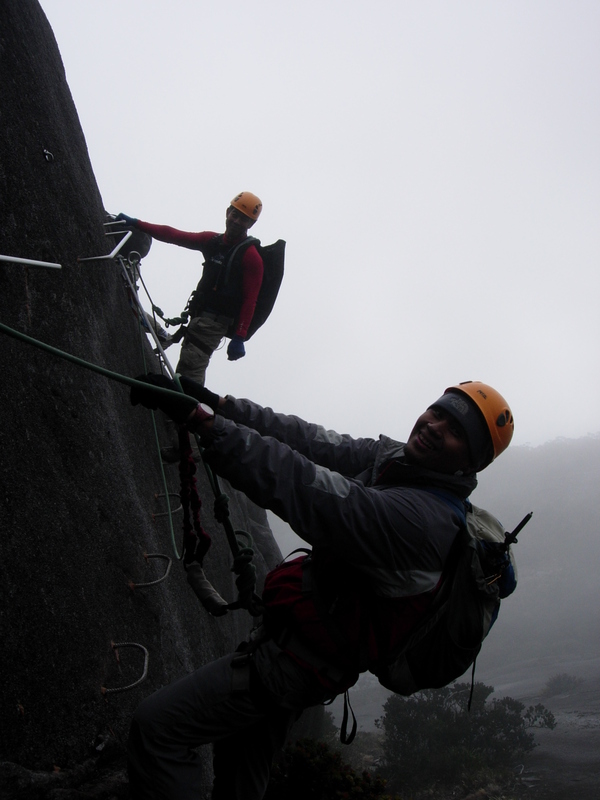 We were now on the sheer granite rock face with the thick white rope leading us to the summit. I had never ever walked so slow in my entire life. It was like one step for every two breathes. I was in automatic pilot and was just trudging and trudging along the rock surface. I couldn’t imagine how it would be like at Everest. 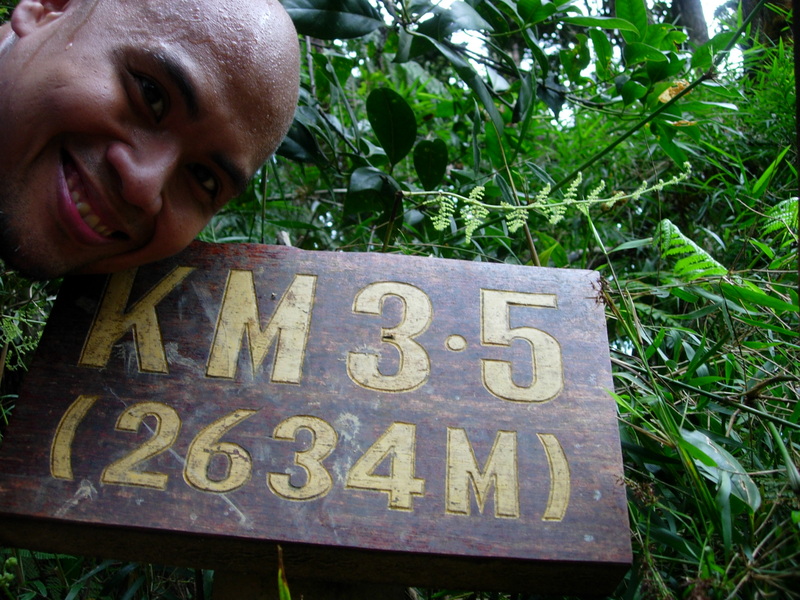 At the 8.0 kilometer mark, I could finally make out the steep trail to the summit. Maik had already caught up with us. People were stopping and drinking coffee or tea. The sky was slowly turning to violet. It was past 5 already. 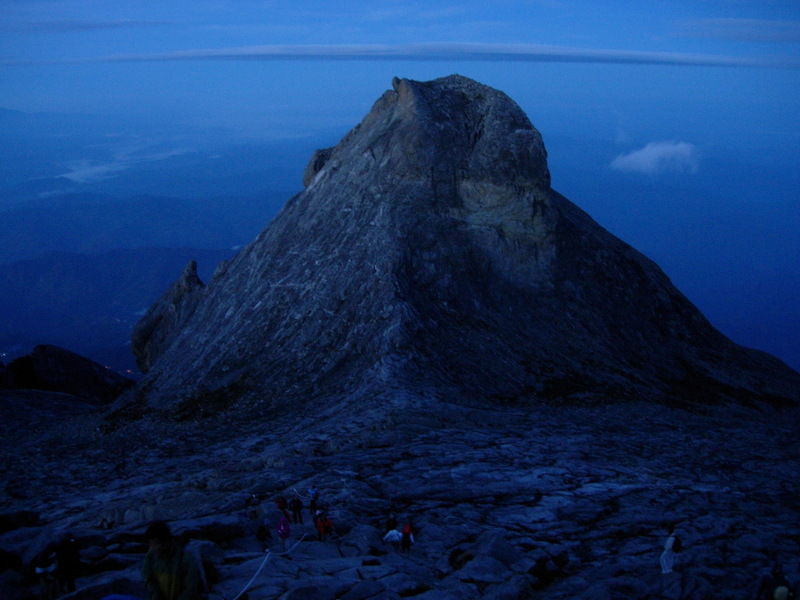 I slowly clambered up the rocks and boulders, and as dawn slowly broke I reached the top of Borneo at 5:30. It felt great. The sun finally rose but it was a little cloudy. We took our mandatory summit pictures and by 6am we started to make our way down in time for the cut-off at the 7.5 kilometer mark for the Via Ferrata. We were reminded by the staff to make sure we make our guide bring us to the 7.5 k mark and not the Sayat-Sayat as the other day, a Filipino climber, ended up at Sayat-Sayat so he did the Walk the Torque instead rather than the Low’s Peak Circuit. The descent proved easy. I had no need for my trekking pole as the granite surface wasn’t slippery at all. We reached the 7.5k mark before 7. The Malaysian guy was there and said that none of his group was going as they were all sick. His sister suddenly walked up which surprised him. We gave them some acetozolamide for their AMS. Karen and Andy arrived. Their guide fetched them at 2:45 and they made up to the summit at about the same time us as. They’re really fast. They did the Panar Laban the previous day in only 3 hours. We put on our harnesses and helmets, knotted the ropes that linked us, strapped our carabs on the cables, and started the walk of our lives! I think the Via Ferrata deserves a blog of its own. So I’m going to stop here and continue with another blog on the Low’s Peak Circuit and the climb down. Day 2 of a Mt. 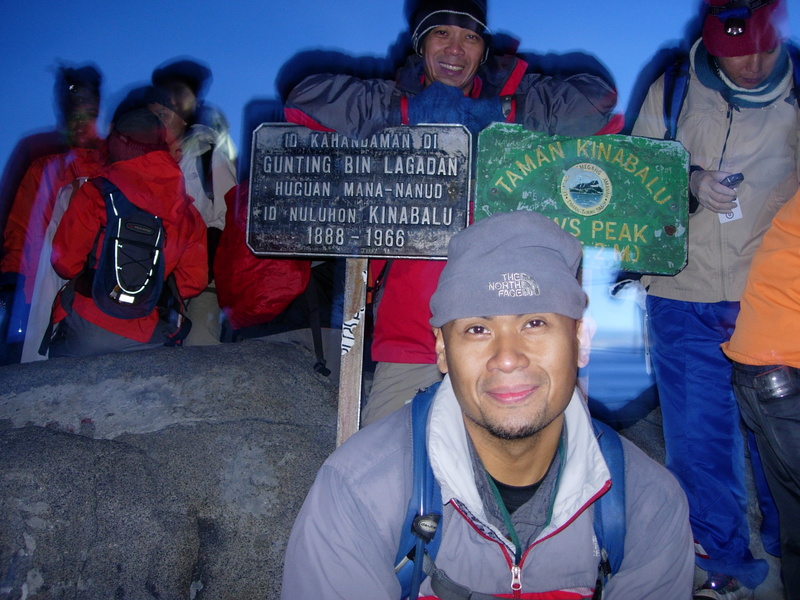 Kinabalu climb is what separates men from the boys. It has got to be the longest day of anyone’s climbing life. Waking-up at 1:30 in the morning is not exactly something I was looking forward to. 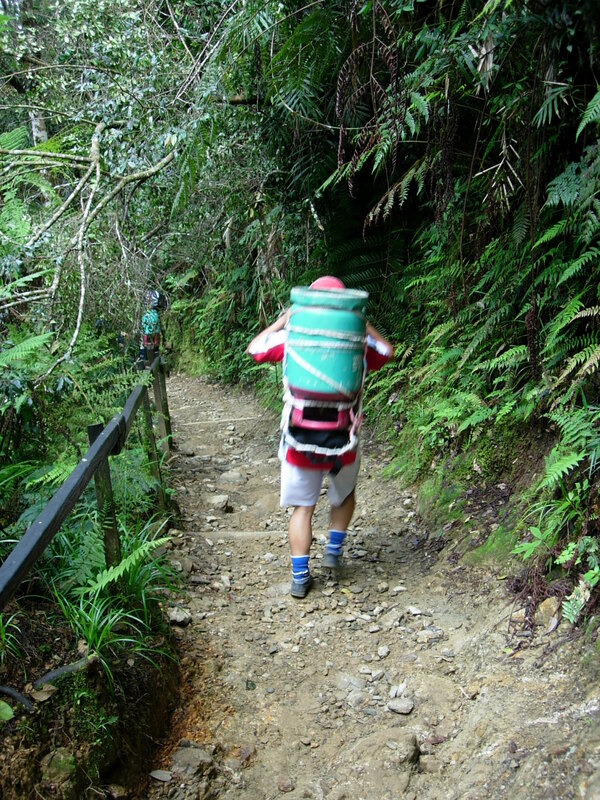 After the buffet dinner at Laban Rata, I took a quick shower and fixed my assault pack. The Germans finished dinner much earlier and were already in their bunk beds. I aimed to be snuggling in my sleeping bad by 8pm but kept coming and going and the light was turned-on. I had already taken my dosage of Rivotril but I kep waking-up. Finally at around 10 when finally the light was turned-off and everyone else in the fully-packed dorm room stopped scurrying, I drifted off to sleep. Gasping and Gaping at the Summit. Dan woke me up at 2 am. Everyone was awake already. I had a quick breakfast of pancakes then went to the toilet. Our guide, Maik, was already there waiting. Karin was still looking for guide. She showed me a pic on her celphone and asked me if the guy sitting on the bench was the one. The other guides had assured her that he was probably on the way. Dan and I started off at 2:30 while Karin and Andy waited for their guide. People had already started out and it was slow going as we were all in a single file, not that you could rush all the way up. It was bitingly cold and really dark. We were told yeterday during the Via Ferrata briefing that the trail was similar to the last 500 meters of the trail to Laban Rata. After the endless wooden steps, we climbed on rocks and boulders which soon gave way to smooth granite. 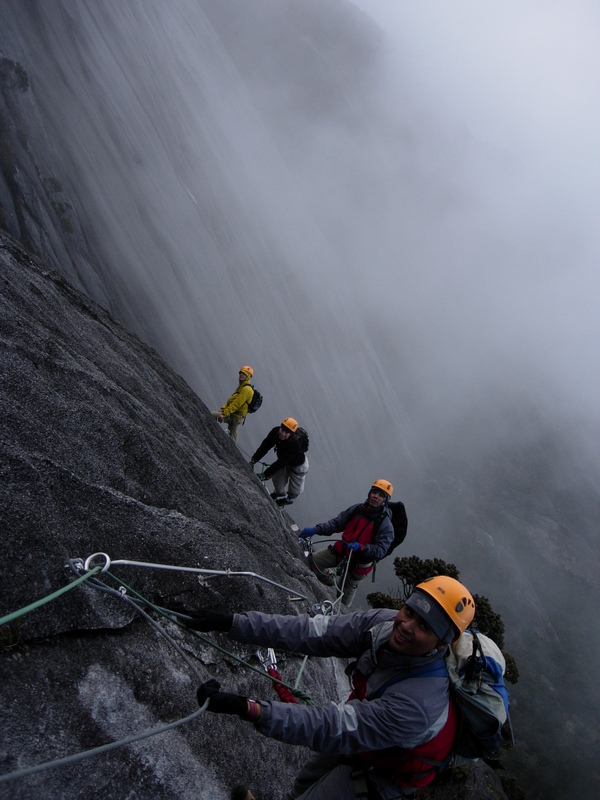 A thick white rope aided us as we traversed cliff face. It wasn’t scary as it didn’t drop straight down but rather gradually descended. 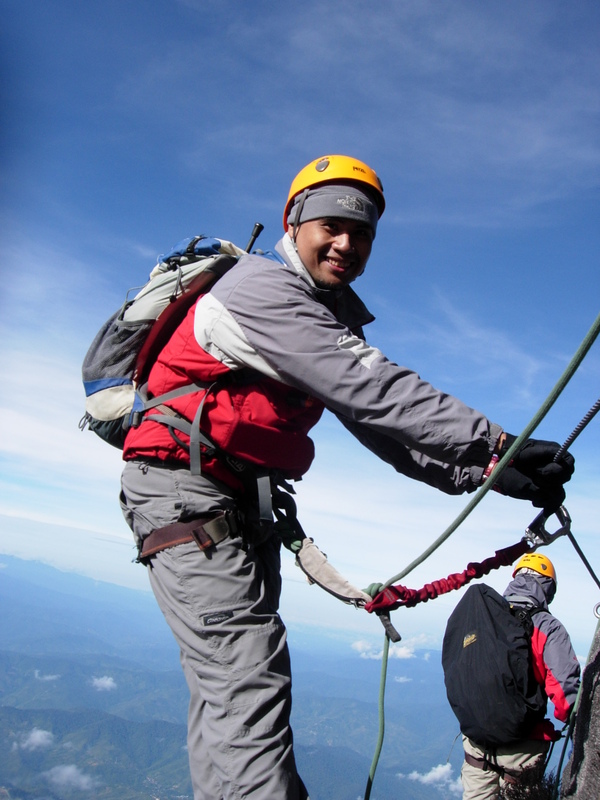 In fact, the mountain guides simply walked along the cliff away from the rope. Nevertheless, it felt good to be hauling yourself up with your arms for a change. A few meters up and we reached the final check point where we had to show our climb permits. It was also the last stop for a toilet break and to load-up on water. Maik went to the toilet and told us he’d just catch-up. About a hundred meters up I wished I also took a toilet break. Too late to go back down now. Past the South Peak, the summit looked deceptively close. A thick white rope guided everyone to all the way up. 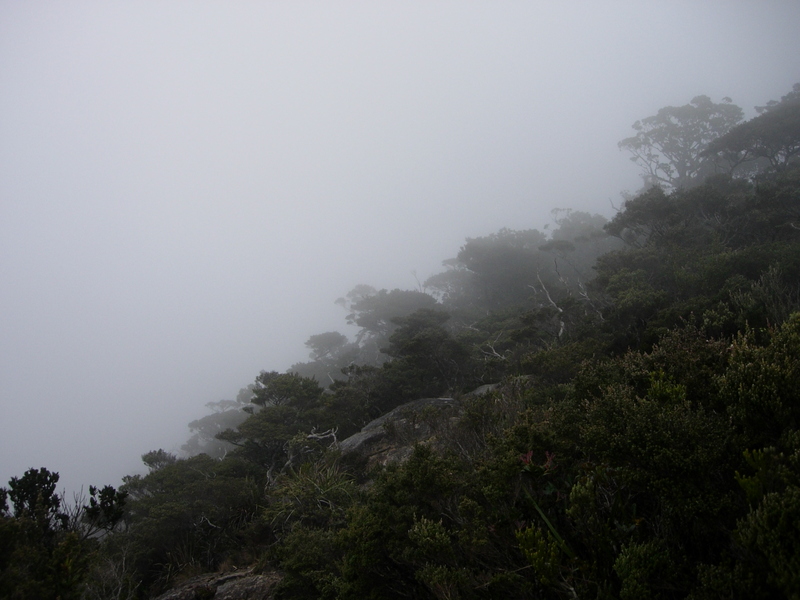 The gradient of the slope was gradual and there was no need to grab onto the rope but we were advised to stay close to it as fog could come and make you lose your way. Some people were stopping to sip from their flasks of hot drinks. I simply kept going and going. I was walking very slowly and had started to resemble a zombie. Maik had caught up with us and was trudging along. It was so cold and the air so thin that everyone step seemed to produce a slight gasp. At this point, I started to cross-out any dreams of climbing Everest or any alpine peak. 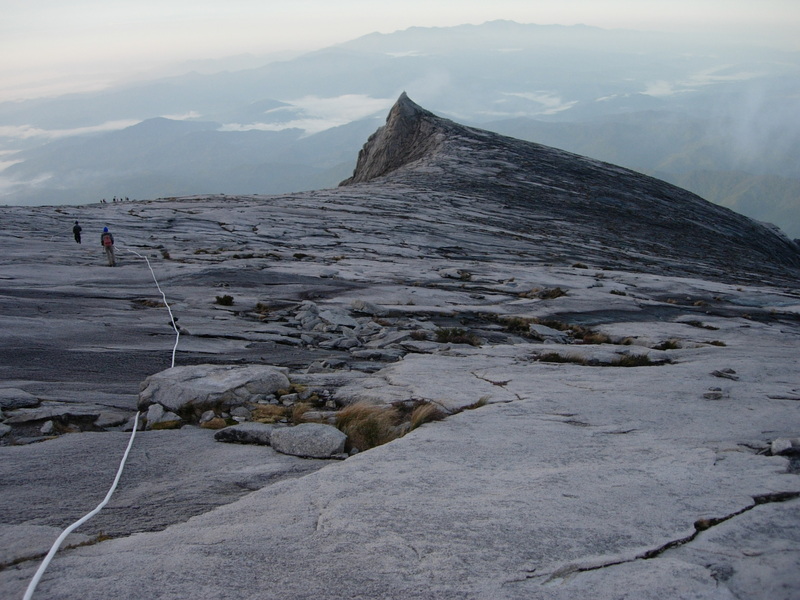 I finally reached the end of the granite slope and scrambled my way up to the tiny summit that was the roof of Borneo. It may no longer be the highest mountain in Southeast Asia but it was still magnificent. It was 5:30 am and dawn was breaking. Maik pointed to summit marker so Dan and I squeezed oursleves past the throngs of people and posed. At about quarter to 6, the sun finally rose. At 6am, we started our descent to the 7.5k mark for the start of the Via Ferrata. Descending the granite slope wasn’t as hard as I thought it would be. I had no need for my trekking pole. We quickly made our way down past people who were still on the way up. The day before, we were told by one of the Mountain Torque staff that we had to be at the 7.5 marker by 7 so we would be the first team to do the Via Ferrata. The actual cut-off is 7:30 but I guess he wanted us early to avoid a “traffic jam” due to a much slower group. Dan and I made it to the 7.5k marker before 7. Maik left us with the Mountain Torque team and said he’s meet us back at Pendant Hut. There was enough time to pee behind a large boulder and eat a chocolate bar. Karin and Andy arrived shortly thereby completing our team. The other team was composed of the Malaysians but only the guy and his sister were able to make it as the others were too sick to even try to walk-up. We gave them some acetozolamide for what was apparently altitude sickness. The third group was composed of some Japanese who looked no older than 25. We put on our safety gears (harness and helmet), roped together than were good to go. We were doing the Low’s Peak Circuit which as estimated to be 4-5 hours. Team leader was Andy followed by Karin, Dan, me, and then our guide, James. 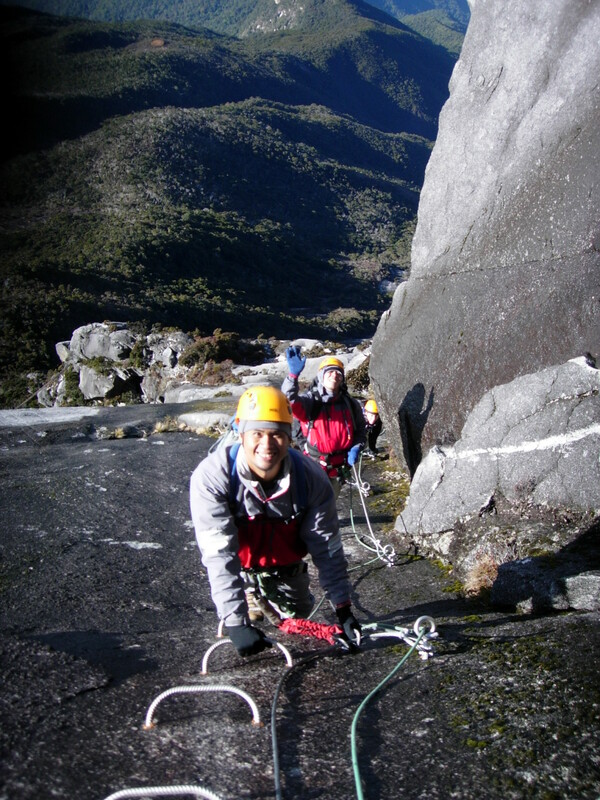 Listening to the relaxed and encouraging voice of James as he reminded us to unhook and hook the ropes, clamp and unclamp our carabiners, and even where to put our feet, was a big boost to our confidence, not that it ever wavered. The most difficult of course is the first step especially the descent. Clinging to the cable, we slowly made our way down the sheer rock face. It wasn’t as nerve-wracking as I thought it would be. I actually found it easier to ignore some of the footholds and just lean back and plant my feet on the granite. It took about half an hour before we reached the ledge and started circling the rock face. It was exhilarating to have nothing but the sky and the mountain around you. The scenery was spectacular and we knew we were seeing things that nobody would be able to see from the summit trail. Looking down from the rock face itself as it dropped vertically thousands of meters down was beautiful in itself already. Some parts were a little tricky especially in areas where some water was trickling down making it a bit slippery but Andy, who was such a good leader, would always advise us of those spots. A couple of hours later, we reached our first bridge—- a suspended wooden plank. To get to it, we had to stoop a bit underneath the cable which presented a problem to me as my trekking pole jutting out from my bag would always snag. A more exciting bridge was a single cable line we had to tread on while holding on to two other lines for support. I never even tried the crossing the cable strung across the river at Manalmon and yet there I was crossing one at 3,000+ meters above sea level! 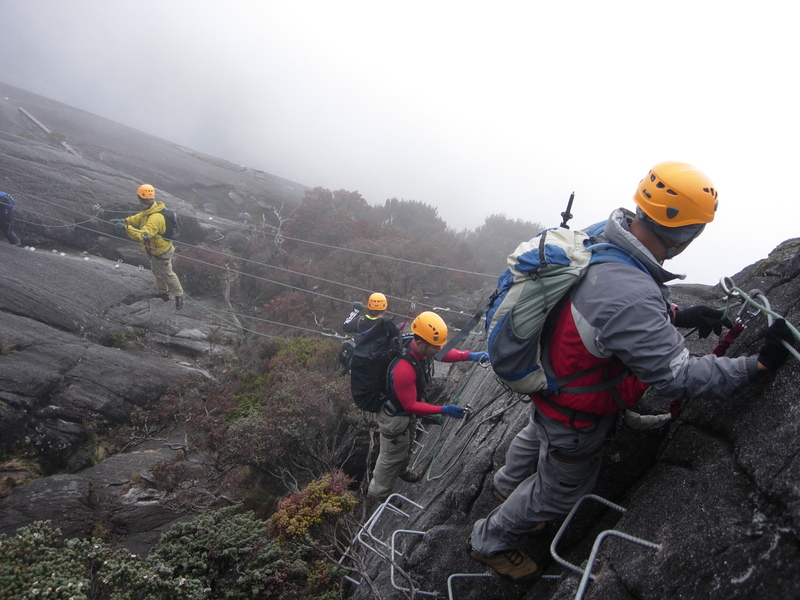 Kinabalu is tortue on the legs was the Via Ferrata is torture on the arms as most of the time you had to lean back with the arms extended as you held on to the cable. Some people make the mistake of staying too close to the cliff face and just inching along which makes for very slow progress. At one point, I tried leaning back without holding on to the cables with only the lanyard supporting me. It was a bit scary but fun. 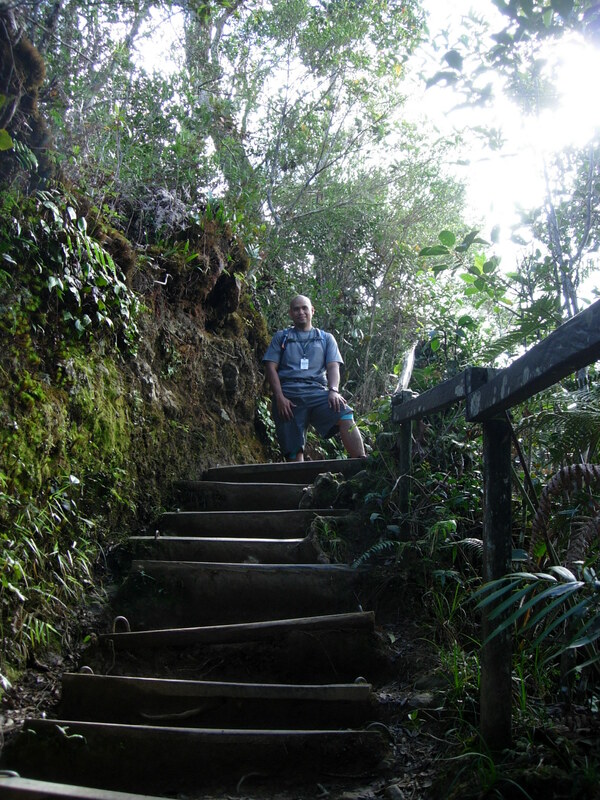 We went all the way down down down until we reached the start of the jungle trail. It was a bit of a relief to finally unclamp ourselves and be walking normally. Mangled trees and branches covered the jungle. The trail wasn’t very visible but it wasn’t enough to make you lose your way. Thankfully, vegetation was thick so there were enough roots, trunks, and branches to hold on to for supports. It was about 15-20 minute walk and we exited to clearing of granite. Dan had run out water and I was running low on it. 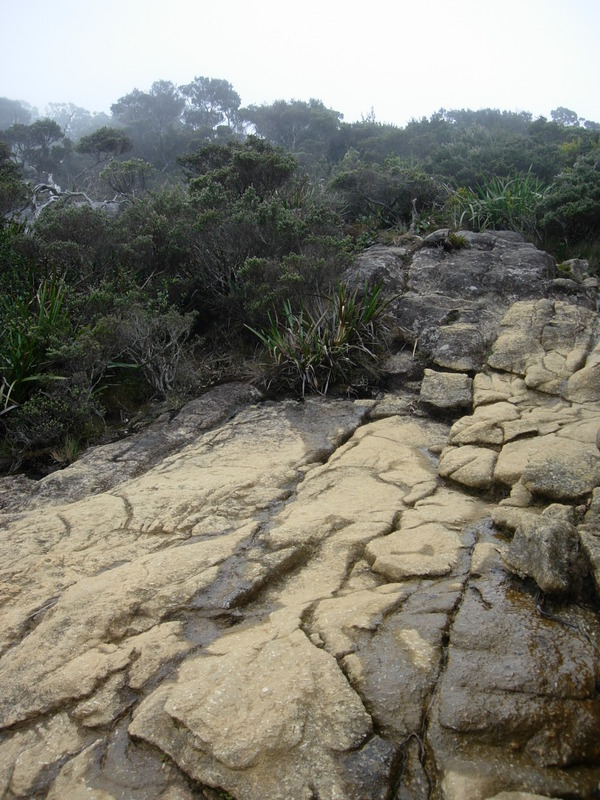 James pointed to a pool of bubbling water from the mountain. Without any hesitation, I sat down and scooped the water with my hand. It was the sweetest and most refreshing water I’ve ever had. Our rest stop cost us a little time as the other groups caught up with us. By the time we hooked-up at the cable for the Walk the Torque part, the Malaysians were the first group and we were last which made it a little slow going. We kept asking James if we could switch places as it was a little boring to be stopping while waiting for the first group to move on. James simply smiled and told us, “later… you will see…” The weather also seemed to be changing and it looked like it was going to rain. At one point, a cloud passed us and we were covered in mist. At the junction where the trail diverges, we chose the longer route so we could go at our own pace as the first group was on the shorter one. The last stretch of the Walk the Torque route was a little slippery and it didn’t help that there was a light drizzle. My arms were really tired and my stomach was shouting for food. 5 hours after we started the circuit ended. I unclamped myself from the cable and walked to the Summit Trail. I was weary but elated. It was the most exhilirating thing I had ever experienced in my life. I’m glad we took the Low’s Peak Circuit as the Walk the Torque route wasn’t much. It was short and the path wasn’t thrilling. Or maybe it was just an anti-climax after the excitement at the Low’s Peak. Incidentally, those taking just the Walk the Torque route start from the Sayat-Sayat checkpoint which means that they’re at a lower level and closer to the Summit Trail. The rain had made the wooden steps slippery and I slip down a few steps. Fortunately, I was holding on to the handrails or I would probably have gone all the way down. I was really really hungry and we tried to rush Summit Trail as best as we can to the Pendant Hut for breakfast as it was almost 12 noon. Karin and Andy were already there and so were the others. Toast and boiled sausages never tasted so good. One of the Malaysian women didn’t look too good as she could hardly eat. Dan gave her some medications to tide her over and we assured her that once she starts descending she’s going to feel much better. The bed was calling me but there really wasn’t much time to rest after breakfast as we had to pack our stuff and descend the mountain. Yeah! After 3 hours of summitting, 5 hours of Via Ferrata, there was still the long hike down. You could cry just thinking about it. Karin and Andy bade their goodbyes. Dan and I were the last ones to leave and at 12:45, we started our descent. At breakfast, peering from the windows, the weather didn’t look too good already. Mist was coming-in and some gray clouds were hovering. I was thinking of the stretch to Pondok Layang Layang which was really steep and slippery due to the stones. 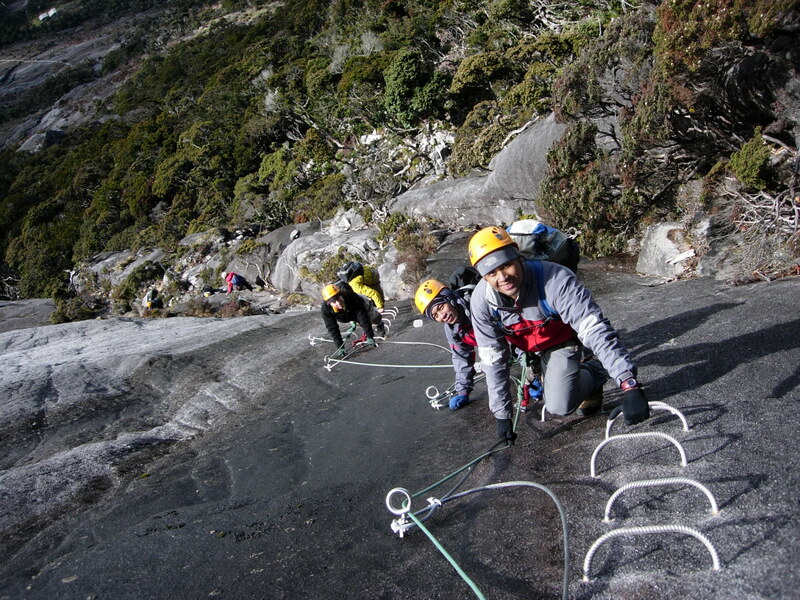 About 200 meters from Laban Rata, we met the first group of climbers on their way up. “You’re almost there! Keep going!” we encouraged them. Slow to descend, Dan soon left me behind with Maik behind me. I just kept going and going and going ignoring the pondoks. Ahead of me were the Japanese which made it a little slow going. At the 4.0k marker, they paused for pictures which gave me the chance to overtake them. It had started to rain lightly and I took out my poncho. The trail was one muddy mess. I promised myself that I would only stop when I reached the 3.0k mark. When I got to the pondok, there was nowhere to sit as a big group of Europeans had taken over the entire pondok and didn’t seem to be moving forward anytime soon. I leaned on my trekking pole to rest a bit and tried to look as weary and exhausted as possible hoping that someone would give me a little space to sit on. Fat chance. On the trail to the 2.5k mark, I finally caught up with Dan. We were able to rest at the next pondok. Steep steps were finally giving way to more flat trails. Our final rest stop was at the 2.0k mark after which I just kept going and this time left Dan behind. At each marker, I would shout at the distance “1.5 kilometers. . . 1.0 kilometers . . . 500 meters . . . Carson’s Falls…” Dan would later say that he could hear me shouting all the way. The sight of Carson’s Falls meant that I was near the end of the trail. 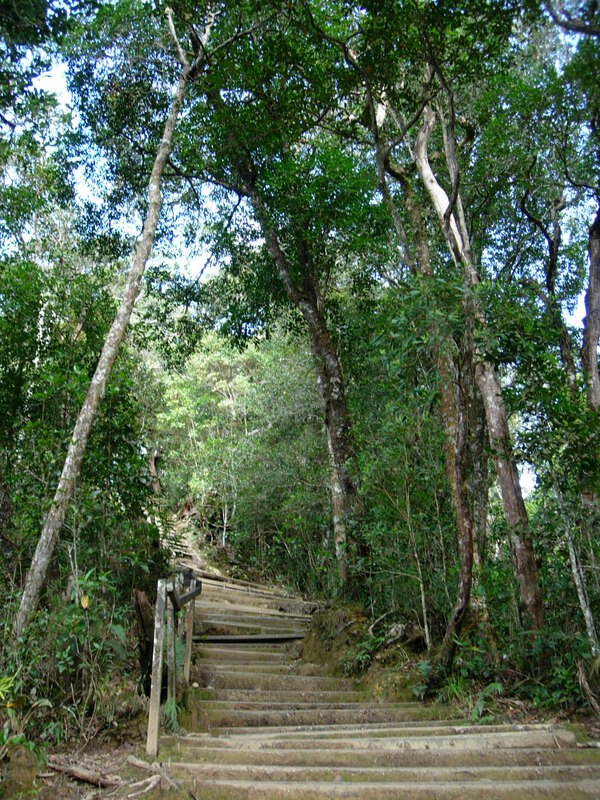 When I finally reached the wooden steps leading to the checkpoint, I could hardly walk. I slowly hauled myself up and then finally presented myself to the park attendant. “Here I am,” I wearily said. It was almost 5 pm. I slumped on one of the seats and waited for Dan and Maik who both arrived a few minutes later. The shuttle to park headquarters showed-up around 5:30pm. 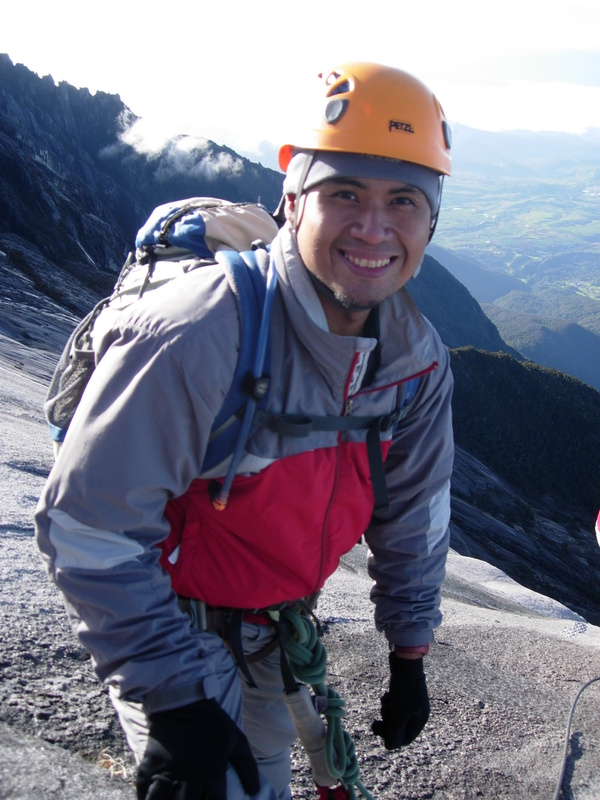 Back at park headquarters, we gave Maik a tip then collected our Kinabalu and Via Ferrata certificates. We still had to haul ourselves to Mountain Resthouse which involved an inclined pathway and some stairs. “Manang” had our old room ready and we collected our bags from the storage area. She was kind enough to heat some water for me as I badly needed it for my sore legs. My body was just shouting for rest and at 6:30pm we were fast asleep. Searching for Food. Our stomachs woke-us up at 12 midnight and we went out for food. Dan led the way to a 24-hour eatery just across the D’Villa Lodge about a hundred meters from us where he had late dinner the day we arrived at Kinabalu Park. We got to the place and it was dark and closed. I gave Dan the evil eye and I wanted to cry. I have had enough cereal bars and chocolates. We just stood by the side of the road as if waiting for it to just magically open. And it did, at least the attached store. A van with Wildlife Expeditions painted on its side pulled-up a some men got out and started knocking on the door. A middle-aged guy opened it and they went in with us following from behind. Learning that we were from the Philippines, the guys made conversation and were very friendly to us. “Here in Borneo we have a tradition of alchohol drinking, ” one guy said as he pointed to the bottles they were buying. “We also eat that,” he pointed to the can of stewed pork we were holding. We bought some drinks, noodles, and the stewed pork. Back at the resthouse, we heated the food at the kitchen, careful not to wake anyone up, and brought it to the second floor landing where our room was. Food never tasted as good. 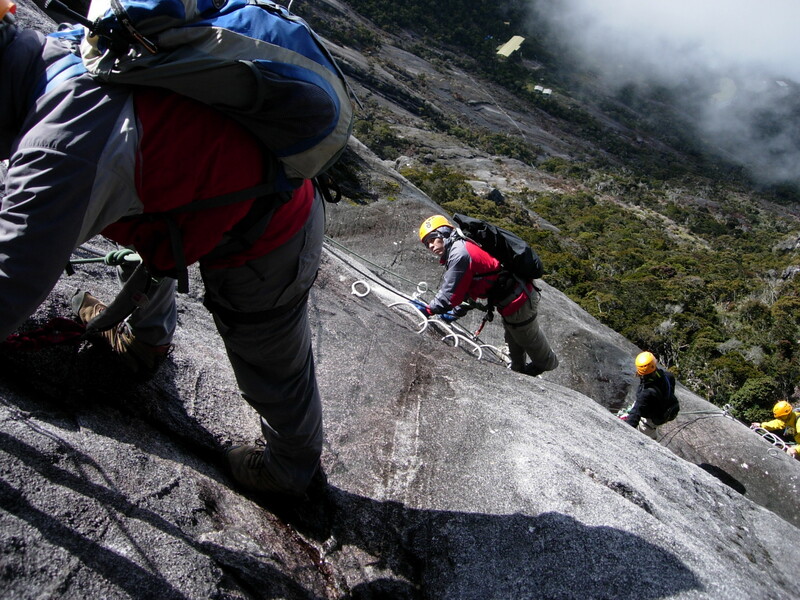 Climbing Kinabalu in itself was an awesome experience more so with the Via Ferrata. It was simply spectacular and not to be missed. Looking at the pictures and the videos on the internet and then going through the orientation, you sometimes wonder why you signed-up for it in the first place. Climbing the mountain is hard work enough and doing the Via Ferrata was going to make it harder. But once there and you’re traversing the cliff and looking up at the sky or at the jungle below you, you know you’ve made the right decision. Life is supposed to be exciting and thrilling. As you clamber around steep slopes and narrow ledges, you know you are living life the way it was supposed to be. I know climbing Kinabalu is expensive that’s why I originally struck it out of my itinerary for my Sabah trip this July and instead just do the trails at KNP after the jungle at Kinabatangan. But if it remains stuck in my head and I get sleepless nights thinking and googling it, then I know I must climb. 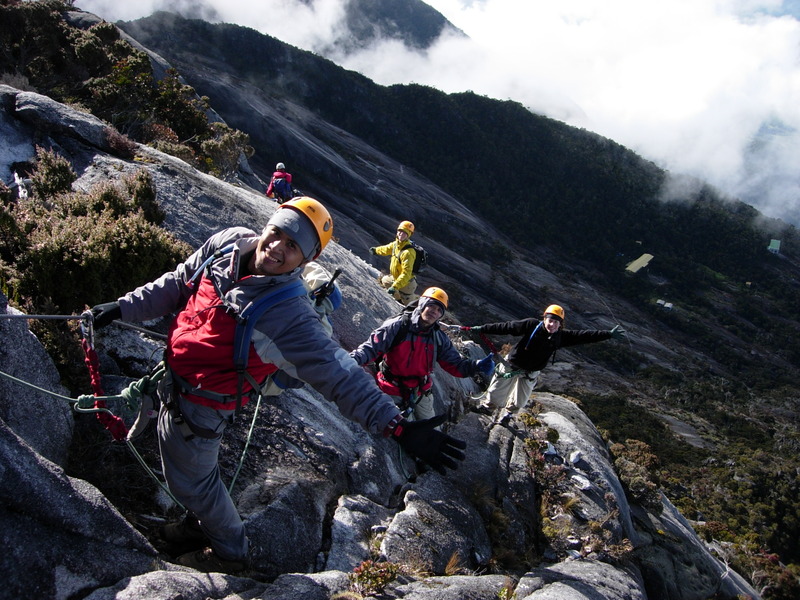 At least I got a really good deal, RM 850 for a 2d/1n package including the Via Ferrata Low’s Peak Circuit. Even with the park fees included, it is still waaaayyy cheaper than the other quoted packages raning from RM1,300-1,900. So I paid the agency through Paypal and thought that was it. But no. Booking the climb is one thing. Preparing the gear for it is another. Rummaging through my closet, I realized I didn’t really have any cold-weather outfit. 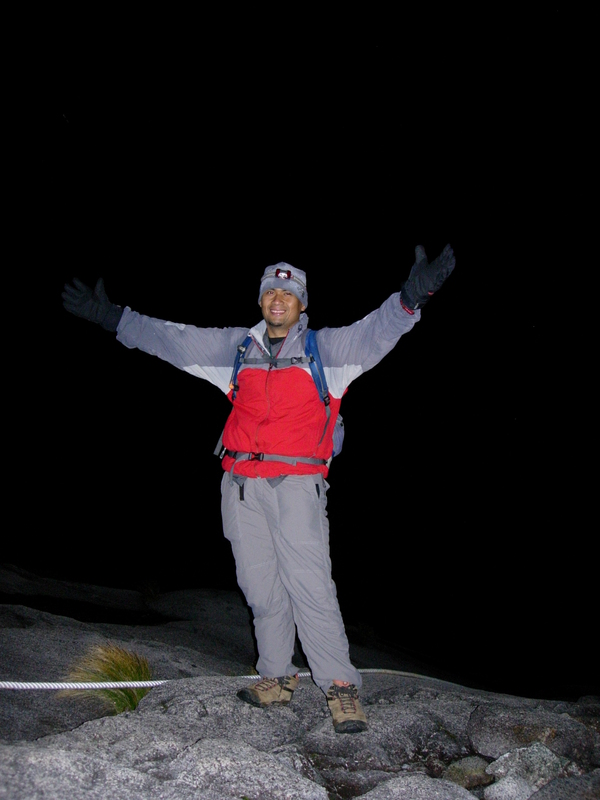 I climbed Pulag with with just shorts and a long-sleeved shirt. Even when summitting at 4 in the morning to catch the sunrise amidst a light rain, I did fine though that was my first lesson in wearing a down jacket— once it gets wait, you end up wearing an armor. Reading all the reviews of Kinabalu— how the temperature is below zero, how it gets really cold, etc. I became more concerned with WHAT TO WEAR rather than HOW TO CLIMB it. To top it off, prior to Kinabalu, I will be in the jungle at the Sungai Kinabatangan. That’s a total of 5 days of outfit. Thanks to Sulit.com, I got a Mountain Research balaclava for only Php 500 and a TNF woolcap beanie for Php 600 (though this is obviously China Class A made). As for gloves, I got a second-hand Lafuma for Php 400. I figured, I cold make do with the bulkiness more than the Php 1,400 I need to shell out for TNF or Columbia’s much sleeker brand new ones. I also got a pair of used Columbia shorts (Php 400), brand new Black Mountain convertible pants (Php 500) and used Millet Stretch Trekking pants (Php 700). Unfortunately, the last two don’t fit me unless I’m able to go back to my old weight. So it depends on how long I’m willing to wait before I think of getting my money back by re-selling them. So I thought I was all done and ready. But there was the case of the Nikon camera which I bought second hand at a shop in Phnom Penh when my Canon powershot stopped working due to the sand at Mui Ne. Php 300 for a replacement lithium ion battery made by Quantaray is still way cheaper than an original one at Php 800. With the Black Mountain and Millet pants currently unwearable, I had to buy a new pair or rather 3 pairs. (Php 895-1,200) And while at it, I decided to buy a 2 shirts as well (Php 350). At least they were quite cheap as I bought local brands. 3K for pants and 2k for a shirt of some famed brand will just have to wait. Lagablab and Conquer will have to do for now. And since the threat of rain is omnipresent, a poncho had to be bought (Php 550). To battle away the leeches, I also got some pair and leg warmers. One of the niftiest stuff I did pick-up was an adjustbale camera pole you screwed on which allowed you to take self-pictures. Normally, you held the camera in front of you and pressed the button resulting in your entire face covering the frame. With the pole, you simply had to put the camera on timer and with the pole, it allowed for a wider distance between the camera and your face. How cool is that! Lest you think I was shopping like crazy, I wasn’t. In spite of my trusty Merrell Continuum boots’ soles falling off due to being left to dry in the sun, I stayed put with the Aigle shoes I got about three weeks ago. I did attempt to buy some boots when I went to R.O.X. last Friday. The Lafuma discountd boots (Php 2,750) were gone and the available Aigle ones weren’t that good. It wasn’t all clothing either as I bought my Acetazolamide for altitude sickness and my stash of trail food (a dozen granola bars and 8 pieces of Goya dark chocolate). I’m almost done except for some hiking socks. 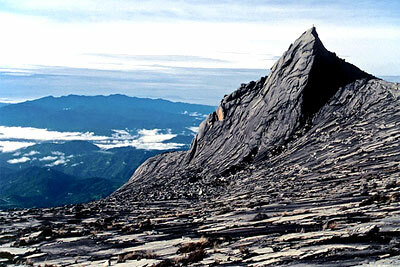 Kinabalu was not my intention when I booked my July trip to Borneo. Even the trip itself was spur of the moment. Air Asia had a seat sale and the offer was too good to pass up— less then Php 1,000 on a return Clark-KK flight. Fortunately, I managed to grab hold of Doc who readily booked the trip. 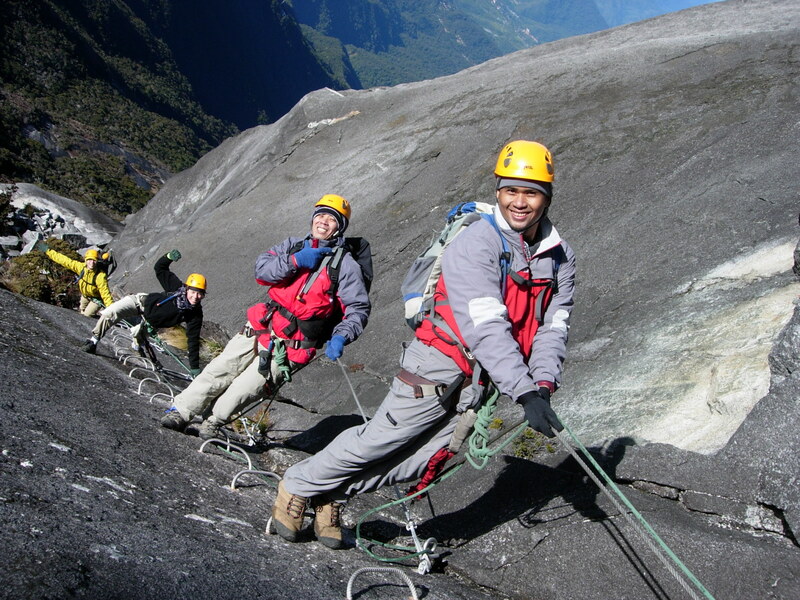 I had long given-up on climbing Kinabalu due to its prohibitive cost — RM860 for the 3D/2N package that Sutera “bloodsucking” Sanctuary Lodges forces you to book. Compare that to a trip to the Sungai Kinabatangan at RM440 for a 3D/2N at Nature’s Lodge Kinabatangan. More importantly, unlike Kinabalu, free enterprise still roam free and alive at the river. So the plan was fly to Sandakan the day after our arrival for the Kinabatangan then spend 2 nights at the Kinabalu National Park to do trails around the base then back to Kota Kinabalu for the flight home. But sometimes, even the best laid plans, or in this case, mindset can make you take back all that you’ve set out to NOT do. Like all the bookings I do, especially spontaneous ones, it all started with google. 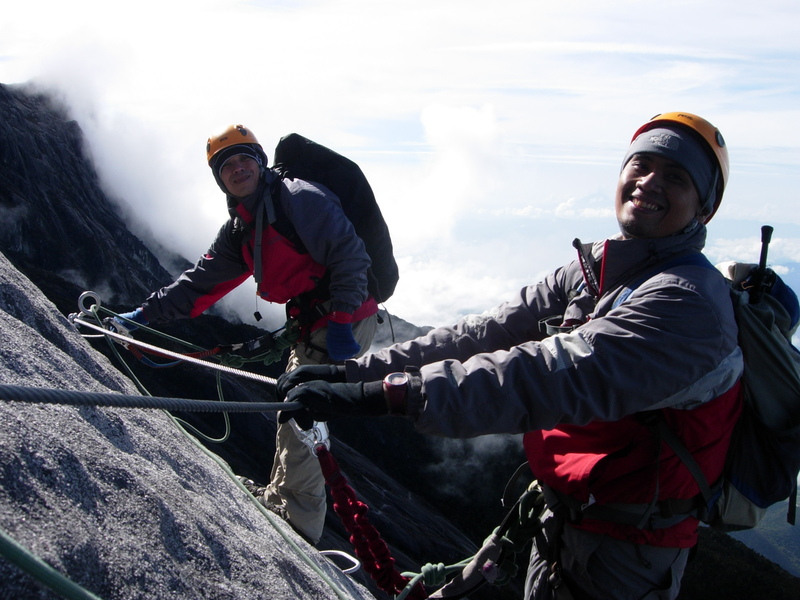 “Kinabalu climb packages” brought in a variety of deals from different tour agencies. The initial rate was disheartening– RM 1,200 for a 2D/1N package. People at the travel blogs said it was a downright rip-off. At the extreme was someone who said that she wished people would stop climbing the mountain until the rates go down. One said, it all depends on how much I really wanted to do the climb. I wasn’t desperate enough. I thanked everyone for their comments and said I’m back to being level-headed and it’s not just worth it. 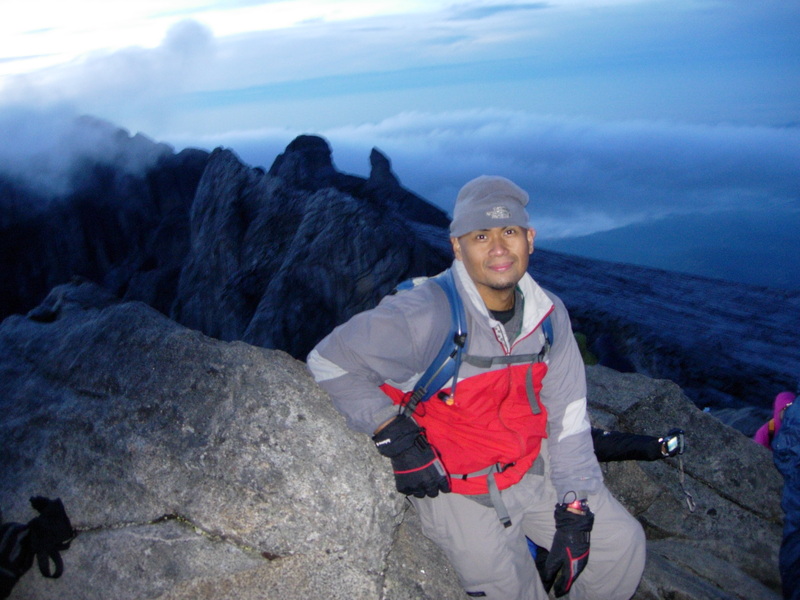 There were reports that if one can call Sutera directly, you can get a space at Laban Rata. Booking online was out of the question as it was just filled-up. So I gave up and started looking for cheap accommodations outside the national park. But still, the mountain beckoned. And I know that this nagging feeling meant I wanted it. Desperately. I was back googling. 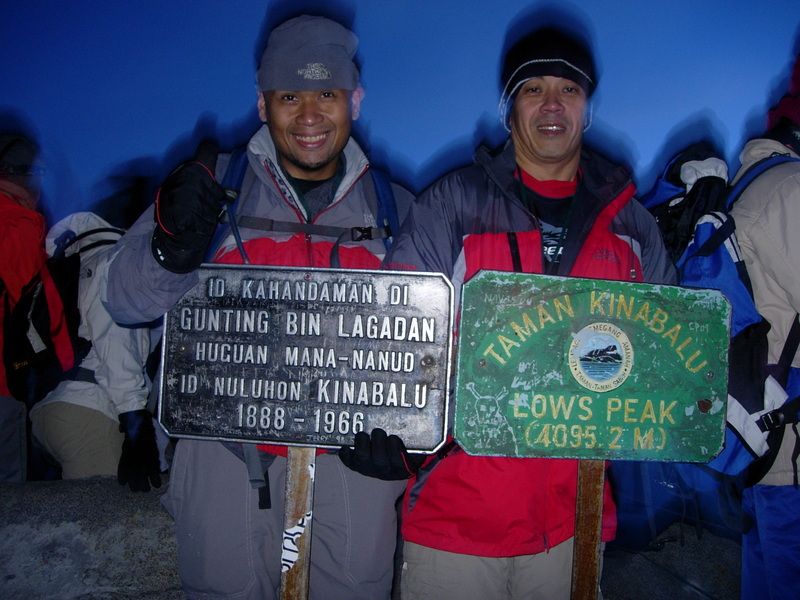 I knew I was going to climb Kinabalu when I had an excel sheet to summarize all the quotations I got. I had fallen into the abyss of wanting it and could not or rather would not get out. Finally, I saw a better figure— RM 780 from Mountain Trails. That was good enough and I was ready to book. Then came the Via Ferrata. I’ve checked the website of Mountain Torque before and I figured it was going to be expensive so I never bothered to inquire. But then reading reviews, seeing videos and pictures, somehow makes you want to re-think things. Maybe it’s not really THAT expensive. So back to googling and to my excel sheet. Either the gods must be smiling at me or I’m just really good at googling. I stumbled on a small independently-run tour company called Whoa Adventures that was offering the Low’s Peak Circuit and climb at only RM850! Even if it did not include the park fees, it was still waaayyy cheaper than all the quotations I got. An additional RM 162 that the entire package was only RM1,012! That was cheap at Kinabalu standards as others like ABC Tours was offering it at RM 3800 and Peterson Travels at RM 2000. More importantly, the July 28-29 dates I wanted were available. 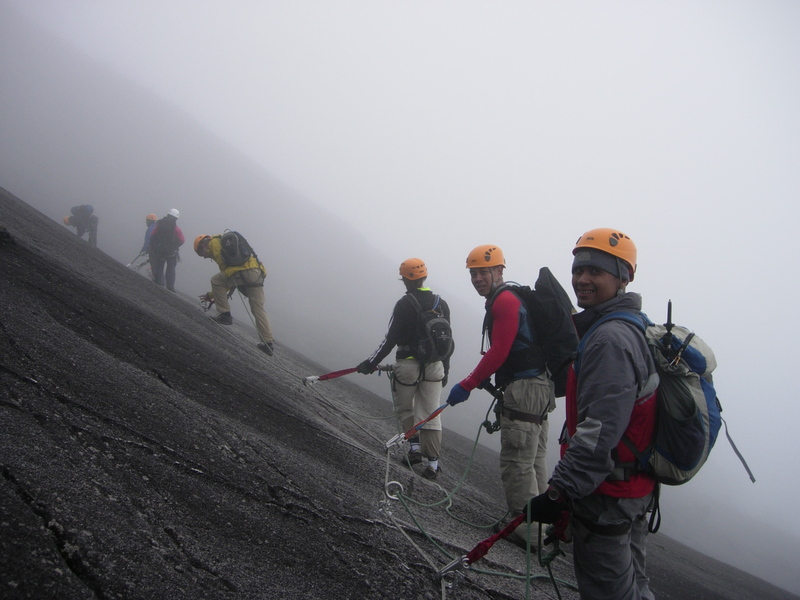 Anyone who has tried to book a Kinabalu package knows that after the rates, the date availability is the next frustration. Just when you’re willing and able to pay your dates might not be available. I signed-up with PayPal and made the transaction. I did have second thoughts about doing the Via Ferrata as I have never even tried the cable at Mt. Manalmon. 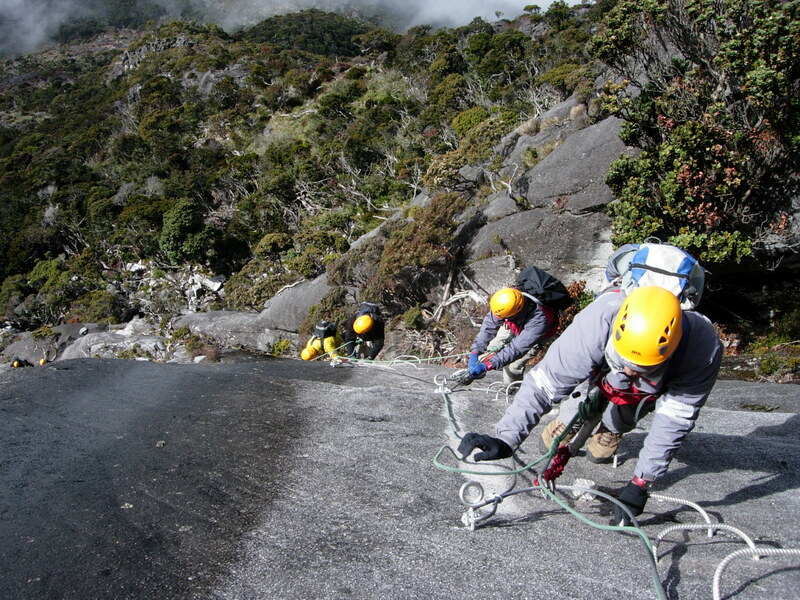 But If I was going to do Kinabalu might as well add the Via Ferrata for bragging rights. And I did remember how much I wanted to do the cable cross at the Xcelerator in Davao but was deterred when I was told it was part of the Php 500 package and couldn’t be added-up to the Php 450 I already paid for2 zips. 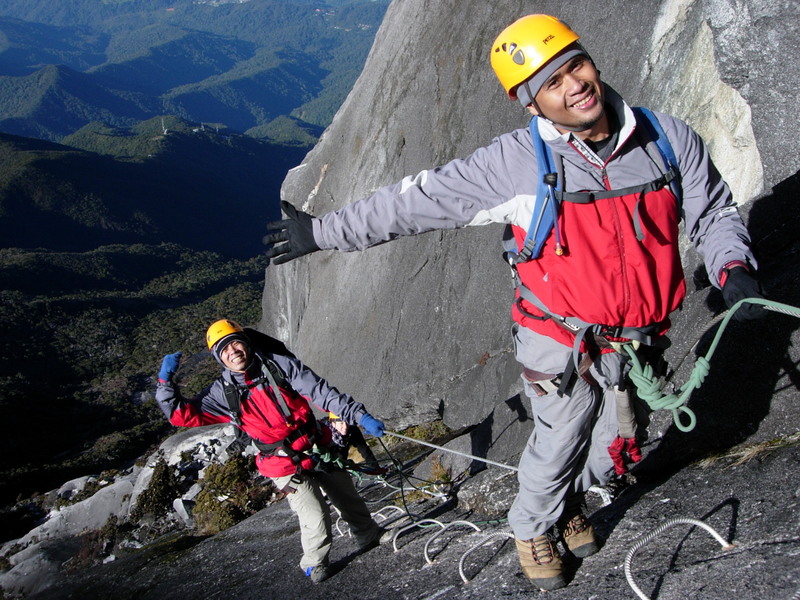 I did ask about doing the Walk the Torque route instead which was shorter (2-3 hours) and was described as Easy and the “perfect introduction to Via Ferrata.” The response from Josen Lim, my contact at Whoa Adventures woke me up “Are you sure you want to the Walk the Torque? It’s a short climb. 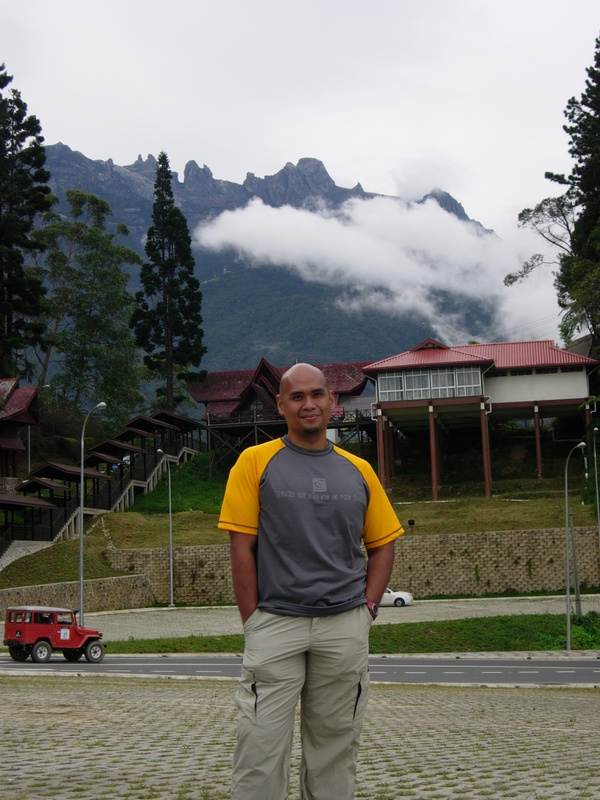 You might not be back to Kinabalu anytime.” Ok. Hit the click here button. Low’s Peak Circuit here I come. I got my confirmation today in my email. We are definitely climbing!